Tom Boonen (Omega Pharma-Quick Step) has taken his first UCI-ranked victory of the 2013 season in a bunch sprint at the end of the second stage of the Tour de Wallonie, between Verviers and Engis. The former Belgian and World champion did win the Heistse Pijl kermesse race on June 1st, but today’s triumph is his first in an accredited road race since September last year. Boonen’s 2012 season could hardly have gone better, with victories including Gent-Wevelgem, the Ronde van Vlaanderen and Paris-Roubaix, but an early crash in the 2013 edition of the Ronde saw him injure his knee and miss the end of the Classics season. Since his crash Boonen has completed the Tour du Picardie, the Tour of Belgium and the Tour de Suisse, but abandoned the Österreich-Rundfahrt earlier this month. He took a second and a third in the Tour of Belgium, but has now finally been able to raise his arms in triumph in a UCI-ranked race. 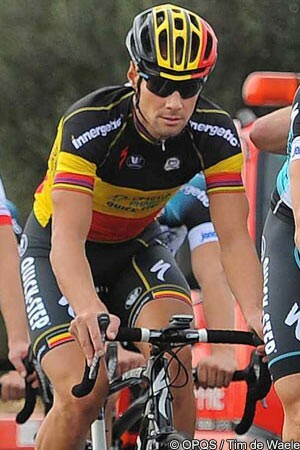 "I am happy about this victory," said Boonen. "The team did a great job today, we always stayed together, especially in the last stretch of the race. In the final 3km there was a descent and we took it in front. Then, Nikolas Maes was with me to pull for the sprint. He did a perfect job and we won the race, so I am happy. “I feel good, my health is much better than when I had some problems last time,” he continued. “I felt good even yesterday, even if I wasn't 100 percent — but that was probably because of a long trip back from altitude camp. Today I felt really good, so that also makes me happy. Last season also saw Boonen win the inaugural edition of the World Ports Classic, his first ever edition of Paris-Brussels, as well as him being part of Omega Pharma-Quick Step’s victory in the World team time trial championships. Having finally taken his first victory of the season, Boonen is now on course to aim for repeats in the second half of the summer. “This race is important to prepare for the Classics in August,” he said. “I will do this race, some training, and then will be ready for the races in August."